How can we as software product managers set up radically experimental projects to gauge the viability of new ideas—without risking ongoing business and without confining ourselves to the restrictions of the current business environment? Rasmus Skjoldan is Lead Product Manager at Swiss-based software vendor Magnolia and posted this question at a recent Boye Software Product Manager Group meeting in London. He shared his inspiration as a product developer by the way the automotive industry uses prototyping – also known as concept cars – and coined the term concept software as a potential answer. This article is based on a conversation with Rasmus and shares some of the thinking behind what he calls ‘concept software’. Rasmus first presented these ideas at the Web Summit in Lisbon in November 2016, where his presentation focused on how to design great products through freedom from the narrow-minded focus of bringing a finished product to market as fast as possible. 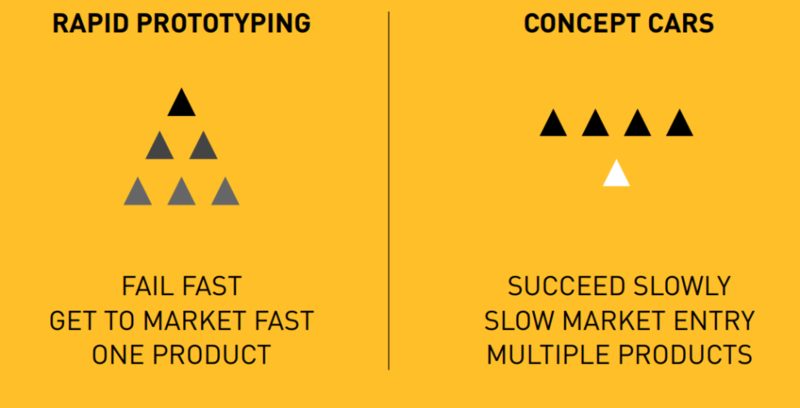 In traditional software prototyping, you build several rapid prototypes which lead to a decreasing amount of candidates and eventually one sellable product. The cornerstones of the process are failing fast, getting to market quickly and focusing on a single solid offering as the end result. The value in terms of external revenue comes from the working, sellable product, whilst the early prototypes and product candidates, that did not get used, are thrown away. As a designer turned technologist turned product manager, Rasmus sees concept software as a way to explore and design differently. There are many examples of concept cars that illustrate this. From the customer point of view, concept software has the potential to evolve brand perception, while increasing employee pride internally as the staff gets to work on cool stuff that is showcased to the world. When asked to look for examples of concept software, Rasmus cited the work at Magnolia with beacons and apps for fast track to IoT technology, while others mentioned the much-hyped Google Wave and other Google products that failed. When a group member at the Boye group meeting asked how to sell the idea and investment to management, another member quickly replied: “Consider it a clever marketing investment”. Thanks to Crownpeak for hosting the group meeting in London in late January.